Salmonella typhi and Salmonella paratyphi A, B and C cause enteric fever (typhoid and paratyphoid) in human. Laboratory diagnosis of enteric fever includes Blood culture, Stool Culture and Serological test. Widal test is a common agglutination test employed in the serological diagnosis of enteric fever. This test was developed by Georges Ferdinand Widal in 1896 and helps to detect presence of salmonella antibodies in a patient’s serum. Patients infected with Salmonella produce antibodies against the antigens of the organism. Antibodies in serum, produced in response to exposure to Salmonella organisms will agglutinate bacterial suspension which carries homologous antigens. This forms the basis of Widal test. The organisms causing enteric fever possesses two major antigens namely somatic antigen (O) and a flagellar antigen (H) along with another surface antigen, Vi. During infection with typhoid or paratyphoid bacilli, antibodies against flagellar antigen of S. typhi (H), S. paratyphi A (AH), S. paratyphi B (BH) and Somatic Antigen of S.typhi (O) usually become detectable in blood, 6 days after the onset of infection. Those antigens specifically prepared from organism are mixed with patient’s serum to detect the presence of antibodies. Positive result is indicated by the presence of agglutination Absence of agglutination indicates a negative result. The paratyphoid O antigens are not employed as they cross react with the typhoid O antigen. If agglutination occurs with O antigen then it is considered positive for Salmonella typhi. If agglutination occurs in A or B antigen then it is confirmed as positive for Salmonella paratyphi. Agglutination will occur in H antigen for all the cases of antigens like O, A, and B.
Antigen suspensions may be prepared from suitable stock cultures in the laboratory. But generally commercially prepared suspensions are used. 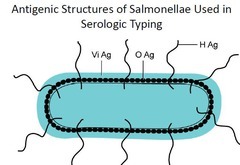 Salmonella typhi is used to prepare S. typhi O and S. typhi H antigens. O antigens for S. paratyphi A and S. paratyphi B are not taken as they cross-react with S.typhi O antigen. H antigen suspension is prepared by treating overnight broth culture or saline suspension of Salmonella with 0.1% formalin. For preparing O antigen suspension, Salmonella are grown on phenol agar (1:800) to inhibit flagella. The growth is then emulsified in small volume of saline, mixed with 20 times its volume of alcohol, heated at 40°C to 50°C for 30 minutes and centrifuged. Tube agglutination has more accuracy as compared to the slide agglutination technique. However, A slide widal test is more popular among diagnostic laboratories as it gives rapid results. Add 1 drop of test sample (25µl) into each reaction circle labeled as O, H, AH, BH according to given antigen solution. Add 1 drop of positive control (25µl) into the circle marked as PC and 1 drop of negative control (25µl) into the reaction circle marked as NC. Add antigen solutions of Salmonella typhi ‘O’, Salmonella typhi ‘H’, Salmonella paratyphi ‘AH’ and Salmonella paratyphi ‘BH’ to circles labeled as O, H, AH, BH respectively in which test samples has been added. Mix it thoroughly with the aid of applicator stick and rotate the slide gently. This is performed for the samples which showed positive agglutination during qualitative test. Dispense one drop of saline into the first reaction circle and then place 5, 10, 20, 40, 80 ul of the test sample on the remaining circles. 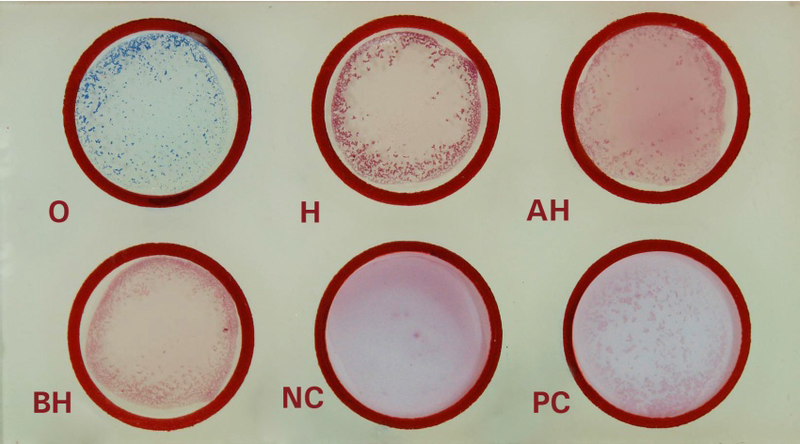 Add a drop of the antigen, which showed agglutination with the test sample in the screening (qualitative) method, to each circle. Mix the contents of each circle with the aid of applicator stick and rotate the slide gently. The antibody titre of the test sample is its highest dilution that gives a visible agglutination. 80 µl corresponds to 1 in 20 dilution, 40 µl to 1 in 40, 20 µl to 1 in 80, 10 µl to 1 in 160 and 5 µl corresponds to 1 in 320 titre. Agglutinin titre greater than 1:80 is considered as significant infection and low titres indicate absence of infection. Tube no. 8 is negative control with 0.85% sterile saline. To one set i.e. from tube no.1- 8 add 50 µl of Salmonella typhi ‘O’ antigen. In second set i.e. from tube no.1- 8 add 50 µl of Salmonella typhi ‘H’ antigen. Respectively for third and fourth sets, add Salmonella paratyphi ‘AH’ and Salmonella paratyphi ‘BH’ to all tubes from 1-8. Mix well, cover and incubate these tubes overnight at 37 degree Celcius (approximately 18 hours). After incubation dislodge the sediment and observe for agglutination. The antibody titre of the test sample is its highest dilution that gives a visible agglutination. Agglutinin titre greater than 1:80 is considered as significant infection and low titres indicate absence of infection. Tests done within 7 days of illness and after 4 weeks are usually negative. The local titre of the place should be known for the results interpreted correctly. This test (Quantitative) is highly time consumable. Previous typhoid vaccination may contribute to elevated agglutinins in the non-infected population. Other infections of non-enteric salmonella infection such as Typhus, Immunological disorders, chronic liver disease may cause false positive reaction. Now the test has become outdated, only blood cultures are recommended. It has been due to false positive results. We heavily relied on an overnight Wi-dal test. Then the rapid slide test and other tests like Typhi dot tests were marketed, which have been to be of low specificity. So it is advised that only blood cultures in the first week of illness suspected to be Typhoid fever, should be used. Widal test is still being used by innumerable clinicians. 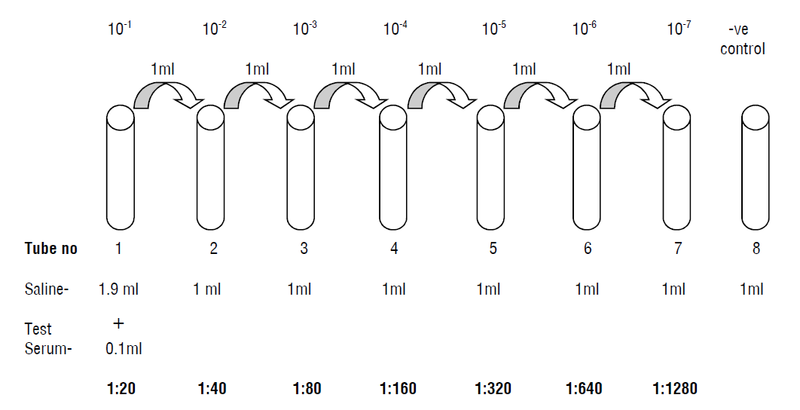 Salmonella para Tphi H antigen- <1:20 Dilution. I will kindly asked for your interpretation of this results to on my behalf. Yes, Mr Dhurba Giri thanks a lot for your interpretation, on Typhoid Test Qualitative and Quantitative Results, But i ask how Blood culture for Typhoid is done? Many thanks dear! Please help me with the interpretation of figurative result (e.g 1:800, 1:1000 and so on…) through my email: yussufsi84@gmail.com hoping to talk to you soon! thanks for good explanation.how culture can be made on typhoid test? Can widal test reveal if you are pregnant? Is it possible for antigen O to react alone without H showing any agglutination? Can plasma be used for widal test?if yes why and if no why? Why is serum used instead of plasma for widal test? Is it positive or negative for Typhoid?